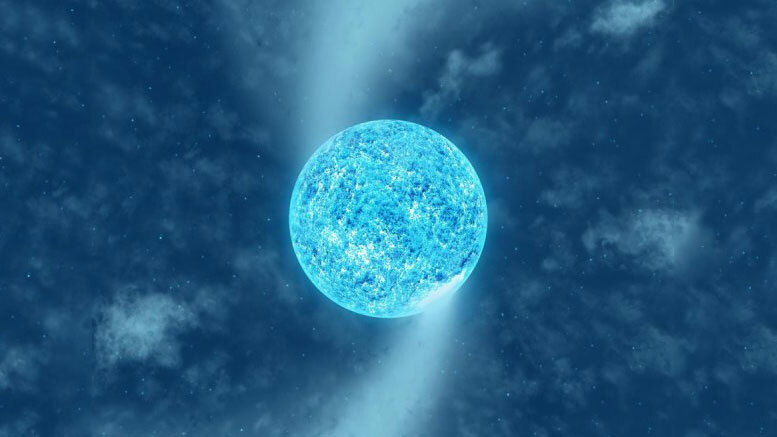 Astronomers recently discovered that spots on the surface of supergiant star Zeta Puppis are driving huge spiral structures in its stellar wind. Massive stars are responsible for producing the heavy elements that make up all life on Earth. At the end of their lives they scatter the material into interstellar space in catastrophic explosions called supernovae – without these dramatic events, our solar system would never have formed. Using a network of ‘nanosatellites’ from the “BRIght Target Explorer” (BRITE) space mission, astronomers monitored the brightness of the surface of Zeta Puppis over a six-month period, and simultaneously monitored the behavior of its stellar wind from several ground-based professional and amateur observatories. “By studying the light emitted at a specific wavelength by ionized helium from the star’s wind,” continued Tahina, “we clearly saw some ‘S’ patterns caused by arms of CIRs induced in the wind by the bright surface spots.” In addition to the 1.78-day periodicity, the research team also detected random changes on timescales of hours at the surface of Zeta Puppis, strongly correlated with the behavior of small regions of higher density in the wind known as “clumps” that travel outward from the star. “These results are very exciting because we also find evidence, for the first time, of a direct link between surface variations and wind clumping, both random in nature,” comments investigating team member Anthony Moffat, emeritus professor at Université de Montréal, and Principal Investigator for the Canadian contribution to the BRITE mission. The physical origins of the bright surface spots and the random brightness variations discovered in Zeta Puppis remain unknown at this point, and will be the subject of further investigations, probably requiring many more observations using space observatories, large ground-based facilities, and small telescopes alike. Be the first to comment on "Spots on Supergiant Star Zeta Puppis Drive Spirals in Stellar Wind"